Progress continues with the proposed exciting development of Newtown Park. A meeting was held on Tuesday at which Derek Crossan attended and work towards part one of the project (the astrograss) continues to go well. Newtown Park Association Community Hub Project has been successful in reaching the “Decision Day” to be held in Bo’ness Town Hall on Saturday March 18th where the public will vote for the best Community Project. Each member of the public who attends will have one vote, the fund is over subscribed therefore only the projects with the most votes will be successful. N.P.A. have requested money to enable architects to provide conceptual drawings of the “Community Hub” – these drawings will be part of our future applications to funders. The Hub will be a multi purpose building which will be used by the community irrespective of age or gender for a wide variety of social and educational activities, the dressing rooms for the new 3G pitch will also be contained within the building. N.P.A. urge you to visit Bo’ness Town Hall between 11am and 1pm to cast your note in favour of the “Community Hub”. The next meeting of the of the N.P.A. over 55’s men’s group will be held at Newtown Park on on Thursday 15th September at 2 pm everyone is welcome, why not come along for a cup of coffee and a chat. If you are interested please call 07704138039 for more information. Newtown Park Association are having a balloon race. Balloons can be purchased at Maryanne’s or A&J Newsagents. Also home game until the end of September. The balloons cost £2 and will be released on the last Saturday or Sunday from Newtown Park. The furthest balloon will win £50 and the person finding the balloon wins £25. They are tagged with unique numbers that ties back to a register, last year Grant McCormack’s balloon went the farthest, Banchory! For more information contact Robert Snedden or David Aitchison. Newtown Park Association are considering starting a group for men over the age of 55 who are retired or not working. Dependent on the numbers the group would meet at Newtown Park for coffee and a blether either once or twice a month and on occasions could have guest speakers etc. If you are interested please call 07704138039 for more information. Newtown Park is now back in the hands of the people of Bo’ness. We now want to here your views on what the development will produce in a state of the art project that will support the whole community. Here are two pdf fliers you can download. Newtown Park Association are delighted to be moving forward on their ‘Community Hub’ project, with the town becoming fully engaged in the consultation process being undertaken by their consultants PMR Leisure. Newtown Park Association have been awarded funding to help them undertake a community consultation and a business planning process to help them to indentify the needs of the town, to help ensure whatever is built at Newtown Park makes a real difference to Bo’ness. The consultation currently ongoing includes listening to all groups and organisations in the town who want to have a say in the Newtown Park’s future. 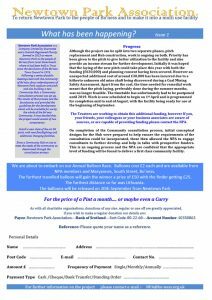 Two years ago Bonet (Bo’ness Networking Group) published Bo’ness and Blackness Community Action Plan and the number one priority from the community was the development of a ‘Community Hub’. The opportunity the site gives, enables the development of a 3G synthetic pitch alongside a new ‘Community Hub’ building which will operate 7 days a week. Bo’ness Academy, through their innovative Life Skills Programme has students working alongside the consultants, assisting with the engagement with the Primary Schools, so we can listen to the younger pupils needs in Bo’ness. Newtown Park is traditionally the home of Bo’ness United FC and of course this will not change. The development of a 3G synthetic pitch and building will also provide Bo’ness United Community FC with a base where they will be able to train and play their matches. The youth and elderly organisations will also have use of the pitch along with the ‘Community Hub’ building on a daily basis. Peter Hay, Chairman of Bo’ness United Community FC says “it is fantastic to think we will have a home for all our players and this will allow us to grow the club at Newtown Park and hopefully the initiative to install a 3G pitch will receive support from Falkirk Council and other funders to make the dream a reality. As a Club we have grown over the last 5 years and have lots more to offer the youngsters of Bo’ness, currently we are constrained by our facilities and have to travel out with the town. We put the youngsters at the heart of everything we do and use the tool of football to help them develop. Having the opportunity to work from a central base and having other organisations in the town, can only serve to provide a greater outcome for our youngsters. The ‘Community Hub’ will widen the opportunities available to all generations in Bo’ness, from after school clubs for the youngsters through to weekly programmes of physical activity for the over 60’s, such as Walking Football and social afternoons. The consultants having met with several older community members are conscious that the provision is complementary to existing provision already available in the town. PMR Leisure has already met with the Community Council, schools and groups of young people through the Avenue Project and this consultation will continue to engage as much as possible in the coming months. Lilias Snedden, Youth Worker from the Avenue, is encouraging as many young people as possible to come forward to ensure their voices are heard in this project to ensure the facilities that are developed meet the future needs of young people. PMR Leisure welcome community organisations and individuals to contact them on [email protected] or 01620895900, to ensure everyone has their say in this process. Alongside direct work with organisations and groups there will be a series of community meetings, open to all, taking place. The first of these will be August 27th in Fisons opposite Newtown Park. Robert Snedden, Chair, Newtown Park Association encourages the town to come forward and give their views as it will be these views that shape the future of Newtown Park owned by the community of Bo’ness. Memberships for 2015/16 are on sale at £3 and can be purchased at Newtown Park between 6.30pm-7pm on Thursdays and Fridays leading up to the A.G.M. The Directors of The Newtown Park Association Limited, Charity Number SCO44092, are delighted to announce that the transfer of the ownership of Newtown Park, Linlithgow Road, Bo’ness, has now been completed from The Newtown Football Park Trust (who recently received the Park from the Council) to the Newtown Park Association Limited. The Charity has specifically been set up as a long term Trustee holding the Park for the benefit of the community. The Charity’s aims include the advancement of public participation in sport and the provision of recreational facilities with the object of improving the conditions for life for the community. Various applications have been made for additional funding to allow the Charity to improve and extent the usefulness of the facility. As you may be aware The Newtown Park Association was formed some months ago with the sole purpose of working with Falkirk Council to return Newtown Park to its rightful owners, “The people of Bo’ness” and to transform it into a multi purpose Community facility. At present Falkirk Council currently holds the facility in trust for the people of Bo’ness. The process involved in setting up the trust as a Limited Liability Company has incurred substantial legal costs, it is estimated by our legal advisors that the transfer could take up to a further six months due to the legal processes required to meet the conditions of the transfer, during this period further substantial legal costs will be necessary. Additionally until the transfer is complete, limited opportunities exist to obtain external funding. Newtown Park has been a part of the heritage of the town since the 1880’s when the miners of the town laid the first turf to create a football pitch. The facility has become a focal point in the area since then, but it has been recognised, by all parties, that the terms and conditions of the existing Trust severely limit its development and its full potential. Our vision is to incorporate facilities at Newtown Park to meet the needs of the community and that the community will be consulted in due course as to what they believe these needs are.. If our bid is successful the monies will be used to fund the costs of the initial transfer of Newtown Park from Falkirk Council back to the people of Bo’ness via the Trust which is the first step in ensuring Newtown Park will still be around for the enjoyment of future generations as it has been in the past.